Another good week for billfish surprisingly for so late in the season. Raul Chollet with Captain Armando got his first marlin. We got quite a few billfish and almost all of them were released. This one was taken just off Punta Perico. From Wyoming, Rick and Amy Kasper always do well fishing with us. They got into a nice school of dorado just off Las Arenas. 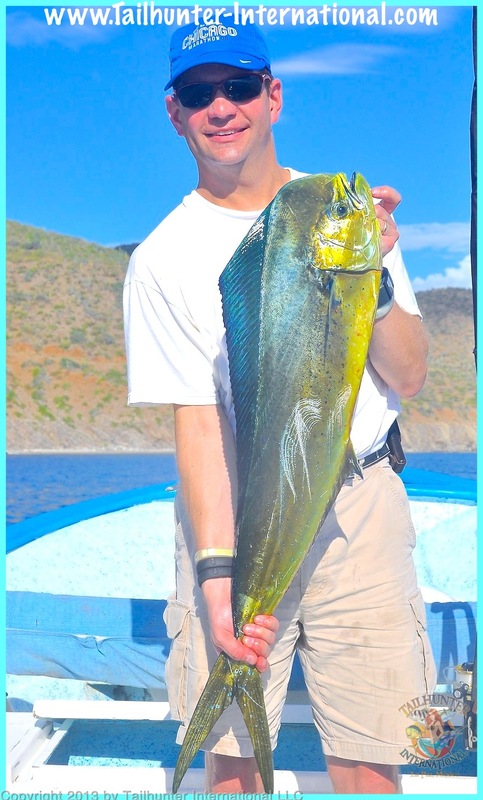 Dorado are getting more scarce as the waters cool, but so far, we’re still finding roaming schools. 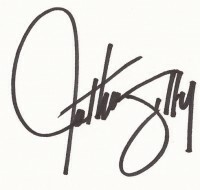 Benny Salgado is often seen playing lead guitar with the Tailhunter Restaurant house band on Friday nights. He went fishing with us for the first time ever on the water and first time fishing. His first fish ever…a striped marlin! Raul Chollet has another dorado for the panga. 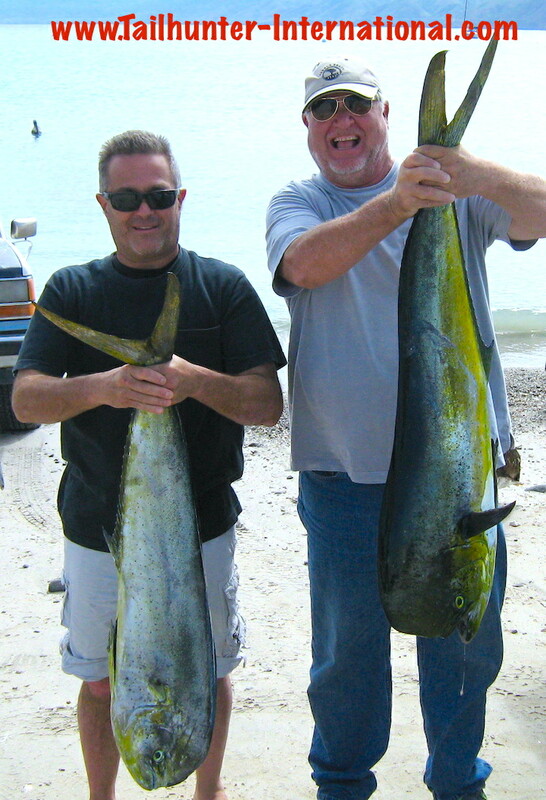 Most of the dorado this week were the 8-20 pound class fish, but they’re hungry and voracious! Even though it’s almost December, there’s still roosterfish in the water! Captain Jorge with Amy Kasper just inside Bahia de Los Muertos caught and released this roosterfish. 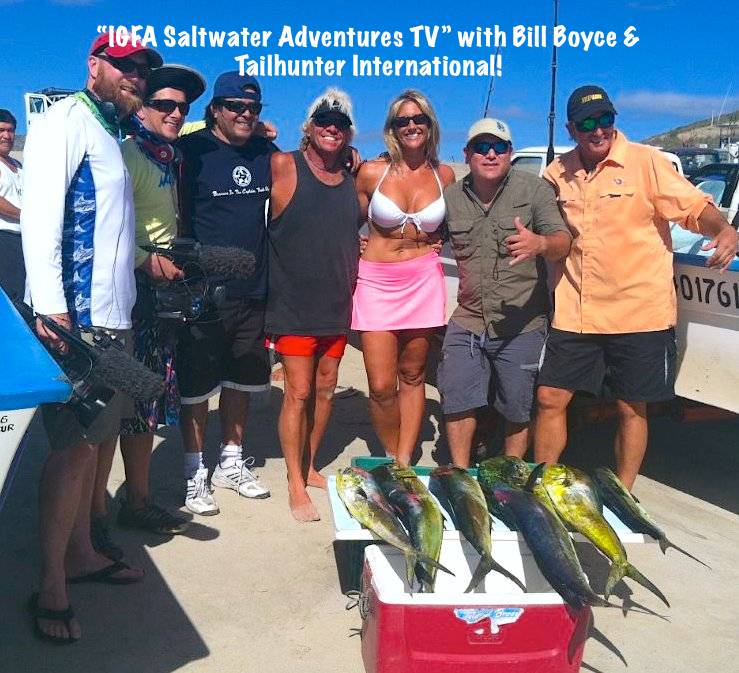 Many thanks to our long-time amigo, Bill Boyce (orange shirt) who brought his great camera crew down this week to fish with us and film for his popular TV show “IGFA Saltwater Adventures.” They got some great footage and had some fun with our folks! BLUE WATER SPECIES STILL HOLDING! It wasn’t a spectacular week of fishing, but given the time of the year, it wasn’t a bad week either and there were some very good catches. It’s just that seasons are changing and water temperatures are dropping taking with it more and more of the warm water species. But, still, we had OK numbers of dorado. Limits were harder to come by, but everyone still got a few dorado between 8 and 20 pounds. There were also some decent surprising roosters around near the Las Arenas lighthouse with most fish between 10 an 30 pounds. We also still have decent numbers of billfish around as well. Every day we got at least 1 or more hook-ups on sailfish or marlin with most fish either breaking off or getting released. All of these species are somewhat unusual to still be biting this late in the season so these catches are treats. More likely, we should be fishing for more inshore species like cabrilla, sierra, jack crevalle and pargo. I imagine, as the waters continue to cool and winds get stronger, we’ll be fishing more and more for these inshore species. One really nice spark this week were the appearance of wahoo. Mid-week, we got into a nice jag with several of our boats hooking up to the speedsters and a few getting boats. All of these were on the south side of Cerralvo Island and we had not taken any wahoo in about 2 week so this was a nice surprise to get into these trophies! Our biggest day of the week happened to be when TV show host and IGFA Rep, Bill Boyce brought his film crew down to shoot for his TV show “IGFA Saltwater Adventures.” I was pretty nervous. Fishing had not been real great. It was also a full moon and windy plus being “off-season” wasn’t the best time to be fishing! 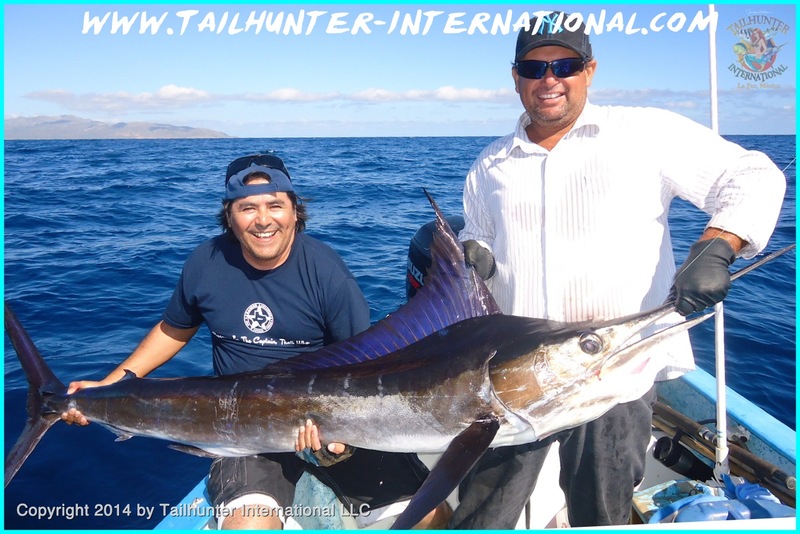 Still, Bill and his crew went out with our Tailhunter Las Arenas fleet and brought the cameras. Between our 3 pangas out, we got some great footage! 6 marlin caught and released. 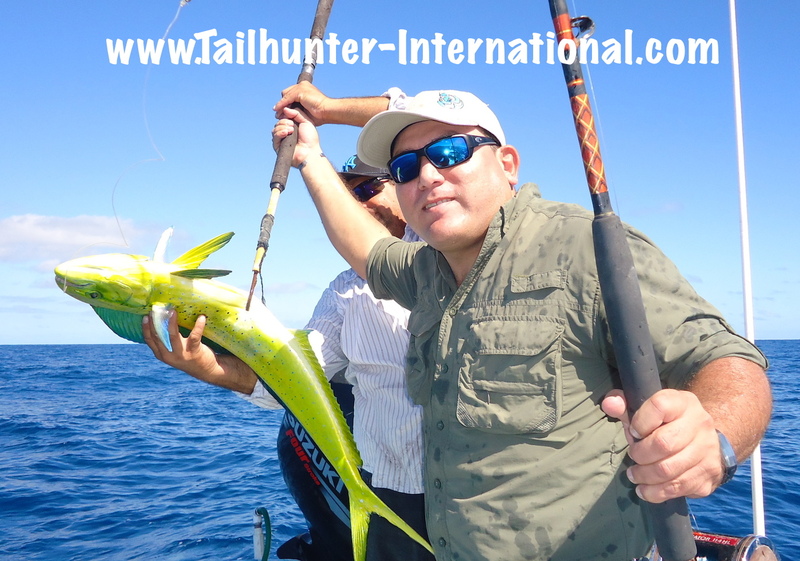 Some great action on dorado plus some rooster fish caught in Muertos Bay! That’s our story! Have a safe and happy Thanksgiving! Surprisingly, we’ve had a pretty nice showing of trophy roosterfish the last month during a time when we normally don’t see roosters! But, they’ve been a great treat with fish like this one caught by Ryan Chipley who loves fishing the light tackle. Captain Pancho, normally smiling, helps out the shot. Note how close they are to the shore! Great action continues for fun school-sized dorado like these despite cooling waters and increasingly breezy conditions. But easy limits are not uncommon like these fish caught by our good amigos, Bob Solee from Portland CEO of B & B Fishing Rods and Mike Anderson all the way from Kodiak Island, Alaska. 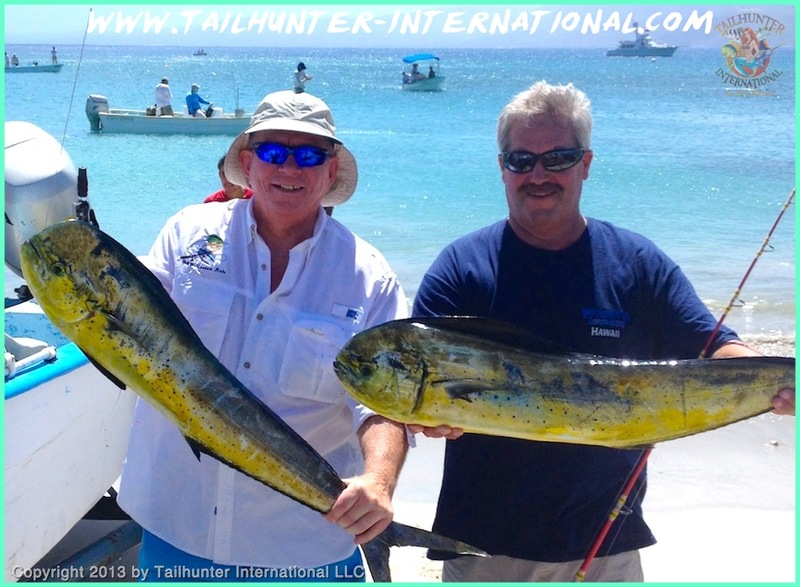 When you come all the way out from Wyoming for your first time fishing in salt water and you get a mess of dorado plus your first marlin, that’s pretty good for Rod Lang with amigo, Rick Kasper, outdoor and hunting TV show host. Marlin and sailfish are still in the area. This one could not be released, but fish was donated. 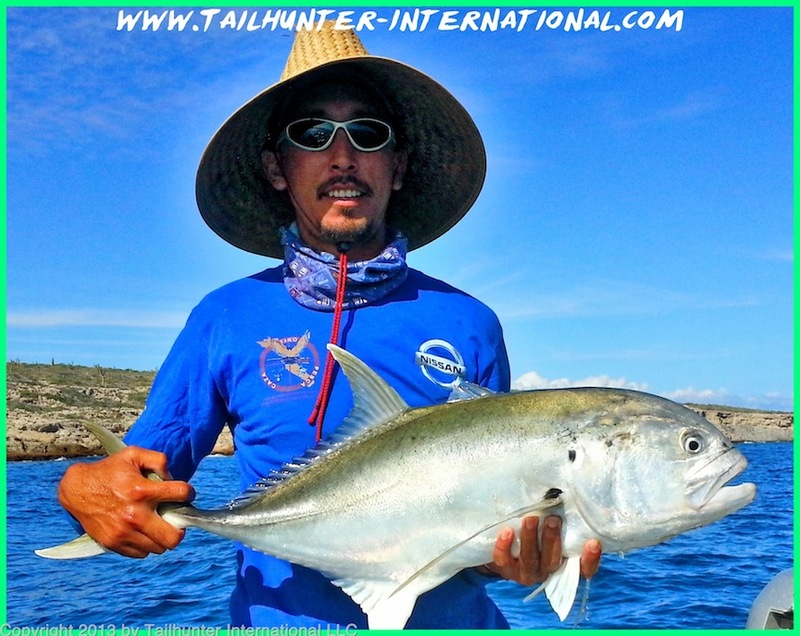 If you’d really like some light tackle or flyfishing fun, not much can top jack crevalle for attitude and power! Schools of the tough fish, called “Toro” (Bull) in Spanish are up close to the beaches and rocks right now and can keep you bent for hours as they’ll hit just about anything tossed their way. Larger ones can go up to 30 pounds or more. BLUE WATER SPECIES HANG IN THERE! We had some really nice weather this week. A bit of breeze, but overall really just sunny pleasant weather. Normally, this time of the year, it can get pretty blustery although if you’re not on the water, just a genuinely nice time to be in La Paz because the town is almost empty of tourists and traffic. Great time to be in La Paz! But this week, pretty calm overall and correspondingly some good solid fishing with good action on a variety of species. 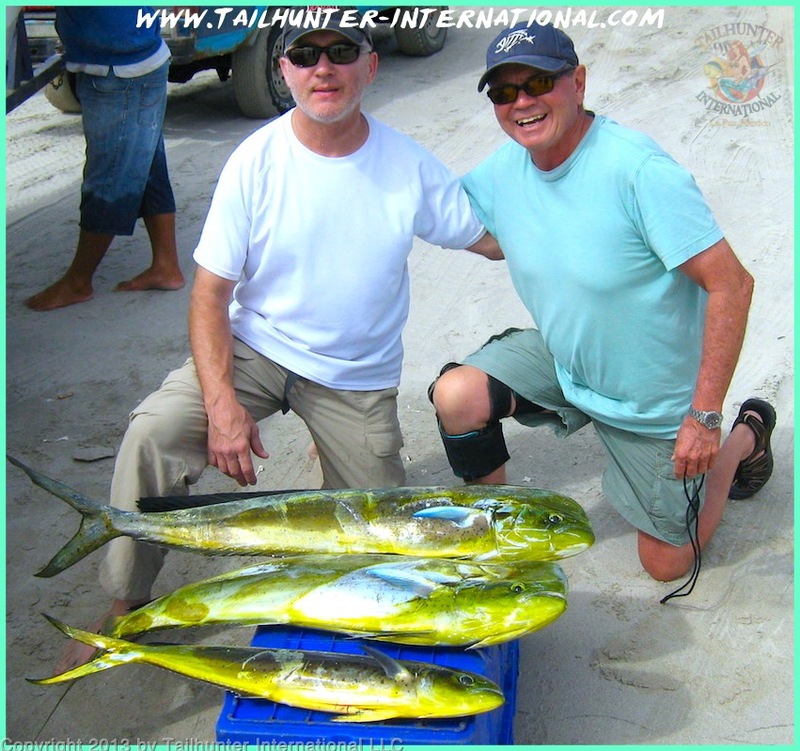 Dorado continued to be the highlight with good to great results on 8-15 pound fish. Perfect for lots of the light tackle folks and snow-bird amigos who really aren’t in town to fish, but are in town these days just to get some sunshine and maybe fish a day or so. Some don’t have alot of experience so this size of dorado makes for great sport as well as great eating for a first-timer. But for veteran fisher-folks as well, nothing wrong with limits of dorado ripping it up either! 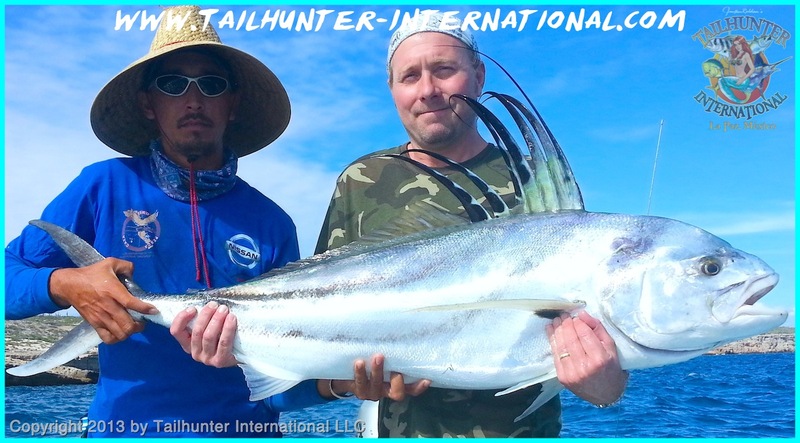 I’m still amazed at how well we’re doing on the rooster fish also! Normally, we just don’t see many rooster fish this late in the season. However, it’s been a banner year for the big pez gallos since April, so I guess I should be surprised. We kinda just think the roosters go away and once the dorado start showing up in May or June, the focus is away from the rooster fish and more towards the dorado and other pelagic species. But, maybe this year, the rooster fish have been here all along! 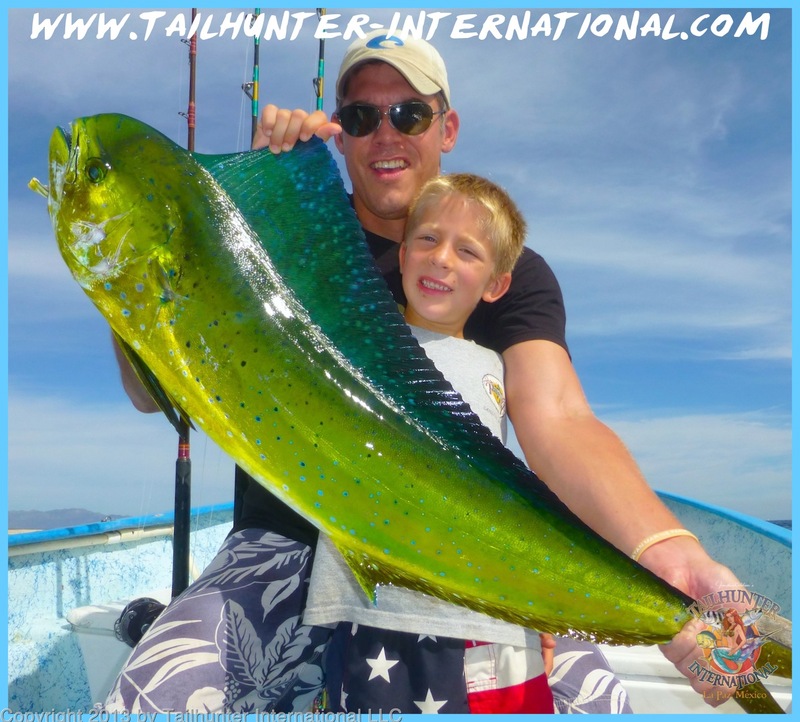 About a month or so ago, just for grins and giggles, some of the anglers started fishing for roosters because they were just tired of so many dorado! And whoa…we started getting into roosters again! Not many…but certainly enough to be a nice cherry on top of a good day of dorado fishing to top it off with a bucket-list rooster or two! And these fish have been a nice grade as well…20, 30…even 50 pound fish have been taken. This past week was no exception with at least a rooster or two caught and released every day running in that 20-30 pound class. As for other species, still getting into billfish by way of striped marlin and sailfish. 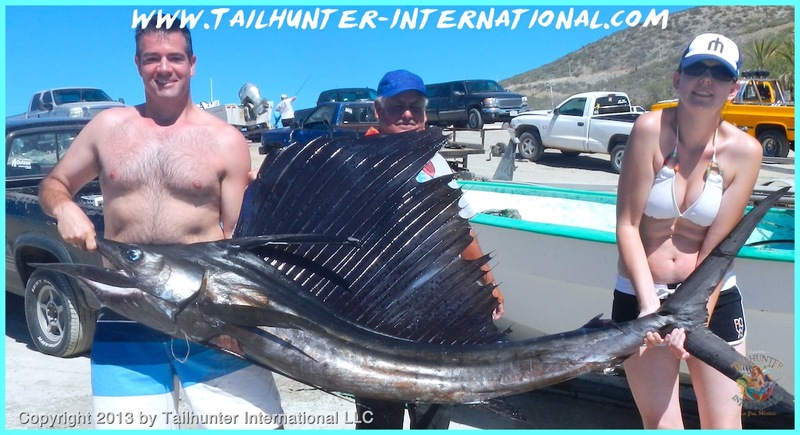 Again, it’s been a super event for some of our first-timers who don’t have alot of experience and suddenly find themselves attached to a leaping billfish! Most are getting released and have been in that 80-130 pound size. Not sure how much longer the blue water species like dorado and billfish will be along, but predictions for the week show that winds will be down so maybe our season will continue to hang on with the fish! A bandana-clad Captain Pancho protecting himself from the sun, helps Leo Green from Washington with one of his dorado. Dorado still biting around our area although seasons are changing. Still good numbers of school-sized fish here! Big smiles from Amy Kasper from Wyoming who got a limit of nice dorado fishing with Captain Jorge with our Tailhunter Las Arenas fleet. A good example of some of our cooler water species that are becoming more pre-dominant was the seasons change. Aaron Chipley holds up some of the best-eating fish in our area…a sierra and a cabrilla (Mexican seabass). 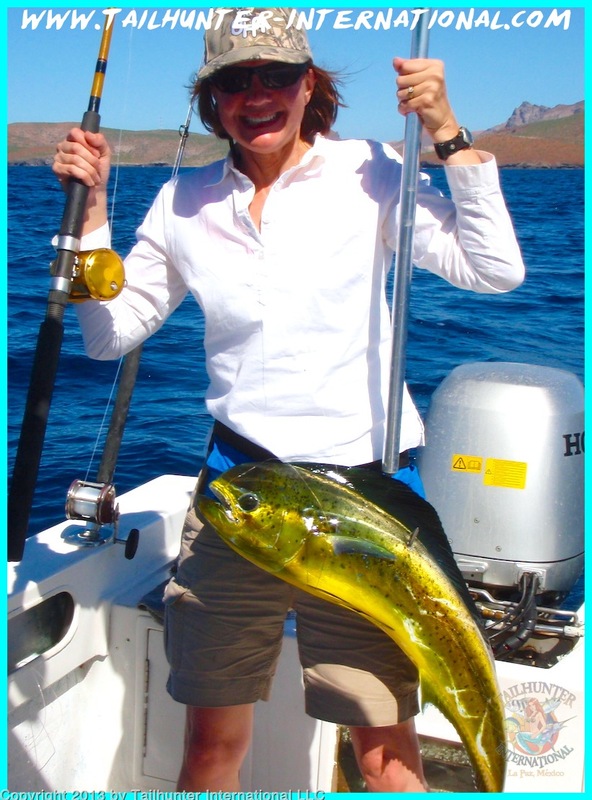 Jane Vanderzanden on her first trip from Oregon to visit Tailhunter in La Paz puts another dorado in the panga fishing with our La Paz fleet north of town. Yes, we’re still hooking marlin and sailfish this late in the season. Bob and Craig Brown with Captain Armando hooked this one and weren’t able to release it, but donated much of the meat. They were fishing near Cerralvo Island. Barney Wisdom and Aaron Chipley pose on the sand at Bahia de Los Muertos after another good day of dorado fishing. 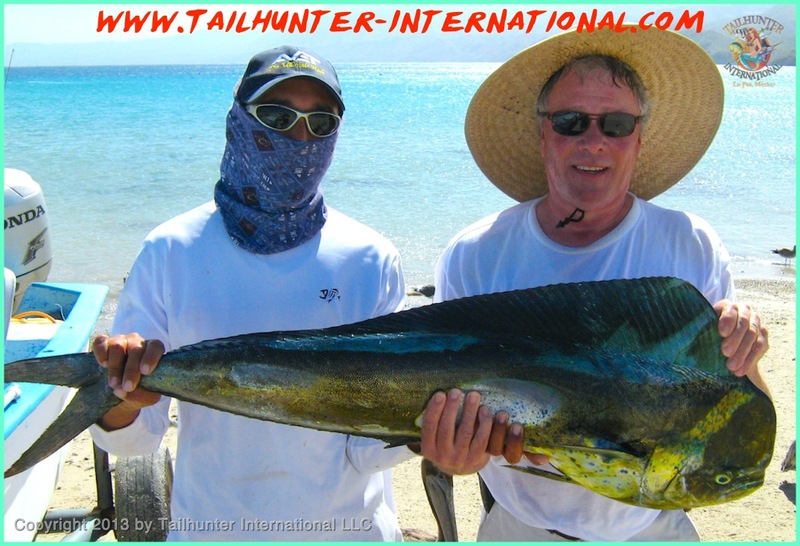 Dorado are still giving us plenty of good action as Jeff and Craig pull up a few nicer models on the beach. We had a pretty good week of fishing here in La Paz, but once again, it’s obvious that the seasons are changing. It’s definitely cooler and windier these days and for at least two days this week, the winds and chop really hampered the fishing. However, for the most part, since most of our anglers fish several days, an “off-day” gets made up on other days! The dorado really keep us in the game, as they have for the past two or three months. Lots of school-sized 10-15 pounders, but this week, we found a few jags of larger fish off Cerralvo Island wind permitting with fish in the 20 -30 pound category that could quickly fill up a cooler. Almost all our fishing now is with our Tailhunter Las Arenas fleet unless someone really wants to fish out’ve La Paz As mentioned above, the winds are kicking up now and when the northern winds blow, it’s just too difficult to head north out’ve the bay and get beat up heading to the fishing grounds. It’s just easier to drive over to Bahia de Los Muertos and fish on the lee side of Cerralvo Island or the lee of Bahia de Los Muertos and still find fish without getting wet or your teeth jarred out’ve your head! In addition to the dorado, we were also getting marlin and sailfish with all fish being released plus some pargo and cabrilla and no shortage of bonito for fun. A few rooster fish along the beach in the 30 pound class plus jack crevalle rounded things out. We did have several biters of wahoo, but the sharp teeth made quick work of the lines and no fish were brought to the boats. In a dramatic last-minute win, after two-days of fishing, the boat “Reel Quest” pulled into the Cabo San Lucas scales with a 192.4 pound yellowfin tuna to sweep the money boards at the 15th Annual Los Cabos Western Outdoor News Tuna Jackpot Tournament. 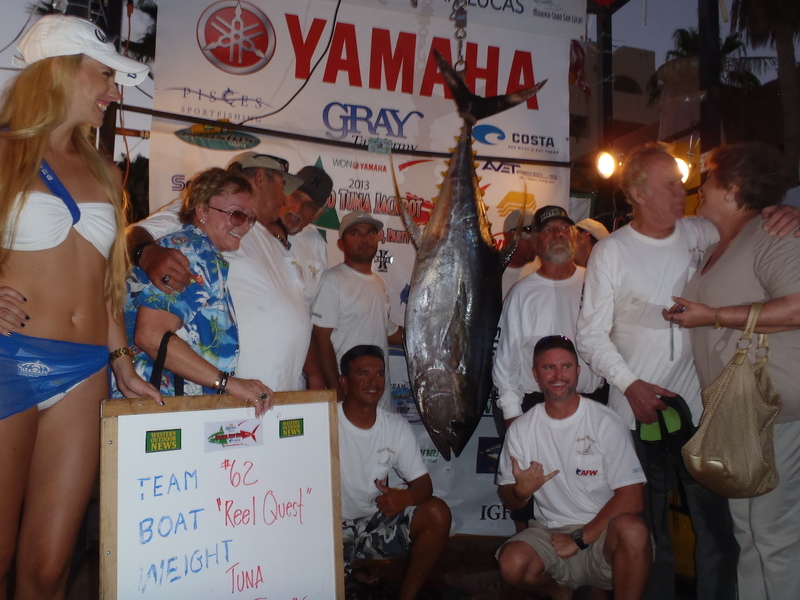 With more than 540 thousand dollars on the line, 7 teams shared the purse, but the big money winner were the team on the “REEL QUEST” that took the big money of $242 thousand dollars with a 192.4 pound yellowfin tuna. As is our usual this time of year, Jill and I spent the week working at the 15th Annual Los Cabos Western Outdoor News Tuna Jackpot Tournament in Cabo San Lucas. It was a great time. The slogan is “Fish Hard. Party Harder” and there was plenty of both with 4 days of partying and 2 full days of hard-core tuna fishing. 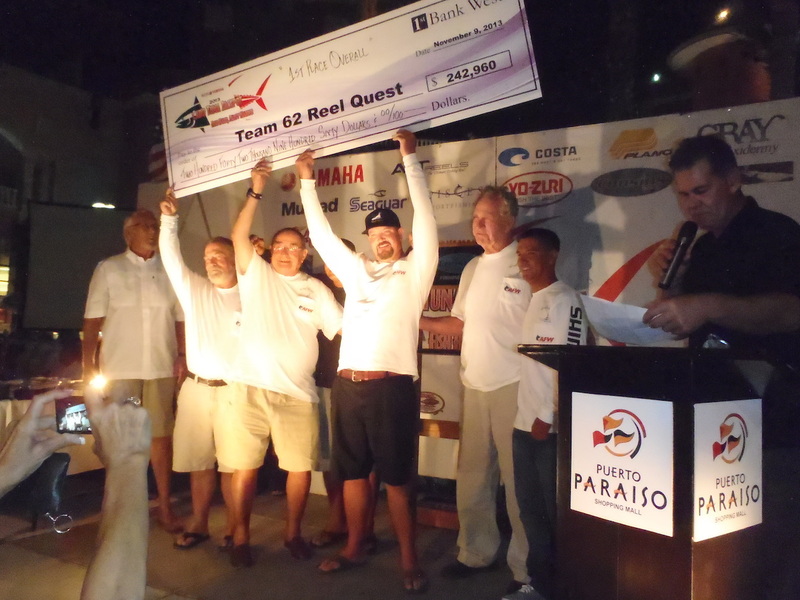 Seven teams shared the purse of over $540 thousand dollars with the big money being taken by the team on “REEL QUEST” who dramatically won in the last few minutes of the 2nd day of competition. They pulled in with a 192.4 pound yellowfin tuna to sweep the money boards. The tournament was the largest of the year for Cabo San Lucas with 134 teams from around the world participating in the big event. In addition to the big money purses, the event also raised thousands of dollars for several charities. In a surprising bite the last few weeks, trophy roosterfish have shown up around the Las Arenas lighthouse which has been a real bonus to many of our anglers like Dan Hicks, our amigo from Seattle WA, who never expected to get a roosterfish this week, let alone a huge 50-60 pounder that he caught and released! 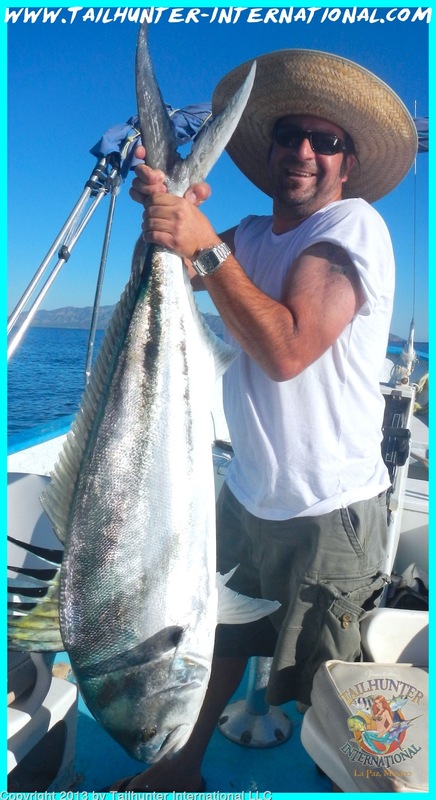 Normally, we don’t see roosterfish this time of year, but lots of our anglers are finding the exotic fish lately. You can never start them too young and Damon Davis, is the perfect dad to show his 5-year-old son, Caleb, how to do it, since Damon runs a sportfishing boat in Orange Co. CA and his dad is our amigo, James “Hawk” Davis an avid ace fisherman who lives in La Ventana near La Paz. 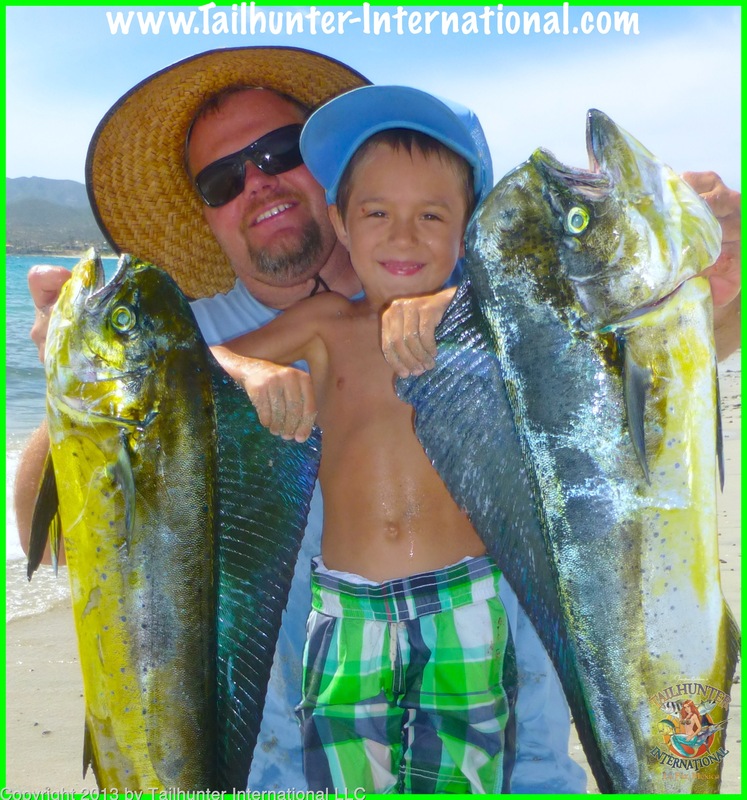 Damon was out fishing near Las Arenas this past week and is shown on the beach with Caleb at Bahia de Los Muertos. Marlin and sailfishing has been unusually good the past few weeks and it seems we hook several a day. About 90% are getting released or busting off…not surprising since we’re often fishing wit light tackle, but they’re still great fun. Leo Green from Washington got this striper while fishing with Captain Jorge of our Tailhunter Las Arenas fleet. The fish couldn’t be released but the meat was donated. 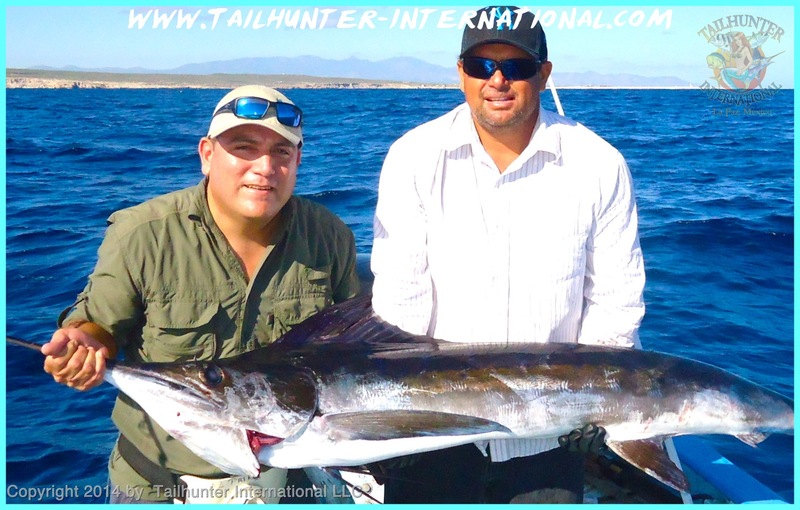 Ed Hicks and Tiffany Isaacson were on their first trip fishing with us in La Paz. Tiffany wasn’t even sure she wanted to go fishing, let alone go to Mexico, but she’s convinced now. After a week of dorado fishing, she also got this nice sailfish off Cerralvo Island. Most of the meat was donated after it was not able to be released. Tiffany and Ed are from Washington. From Oregon, Miles Brown, visits us every other year-or-so and always does well fishing with his dad, Rod. He shows off one of the school-sized dorado they caught off Cerralvo Island. SOME RAIN AND WIND AS SEASONS CHANGE AND SEASON TAPERS BUT FISH STILL BITE NICELY! We had another solid week of fishing with dorado again at center stage, but the biggest event would be probably be Mother Nature posting that the seasons are definitely changing. Northern winds, at times pretty strong, pretty much blew all week. That’s significant for several reasons. Not only is is a harbinger of the changing seasons, but it also heralds cooler waters and a changing of the guard as far as fishing is concerned. They are a tad earlier than normal this year, but nevertheless, as they continue to blow and cool things down, the blue water pelagic species will start to move off and we’ll see more inshore species. Therefore, fish like marlin, sailfish, and dorado, that have been our mainstays the past several months will be replaced by more inshore species like pargo, cabrilla, jack crevalle and sierra. Part of that, is also because it will be harder to get too far out away from shore anyway. As the winds hit from the north, it can get downright wet and bumpy. That’s why we pretty much shut down our Tailhunter La Paz fleet mostly from December to March. Unless you want to get soaked and have your kidneys jarred, it’s just not worth it. 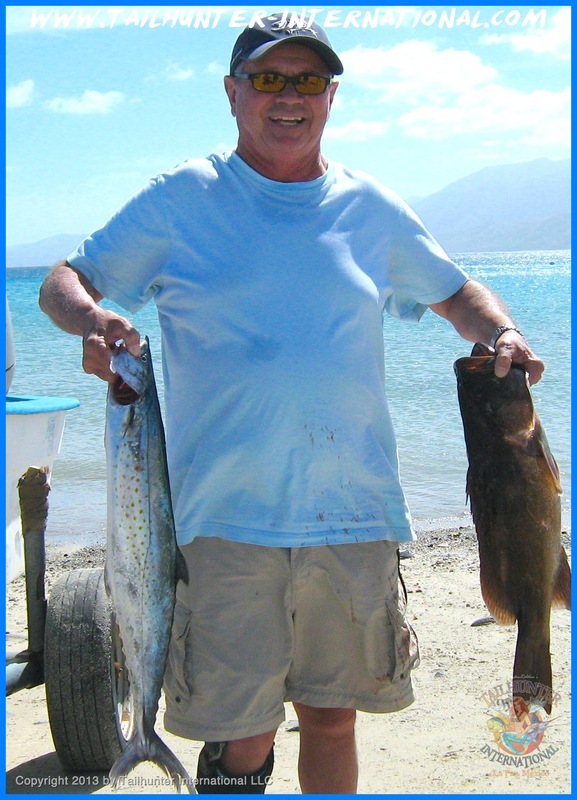 It’s easier to have us shuttle you over to Bahia de Los Muertos and fish with our Las Arenas fleet where at least you’re somewhat protected and the fishing is closer. However, this year, it looks like we’re closing down the La Paz side a bit earlier. This past week, even in La Paz Bay, the north winds had white-caps even in the bay! Plus we had rainstorm Raymond come through. Extremely late for a rainstorm, but we had one really good night of good rain. It didn’t affect the fishing and we still got out and got fish, but this is pretty late in the season to get a rainstorm although it did make for a nice cozy night to stay in and watch the rain in the bay from a seaside restaurant (At Tailhunters, we had a full load of folks watching football plus the rain outside and they enjoyed it!). As, I said, we still got fish! The dorado were still voracious most days with most of our pangs getting limits or near limits of fish…if that’s what they wanted. The dorado have been so prevailant that anglers would load up on more dorado than they wanted…even catching and releasing so many…that they would try for other species instead. So, the counts didn’t really reflect the reason some anglers didn’t get limits of dorado. It was because the anglers weren’t fishing for dorado. Instead, the boxes and action were filled with other species…marlin and sailfish were still out. I’d have to say the billfish angling was good to excellent most days with, again many of the guys getting their first billfish caught and most released. 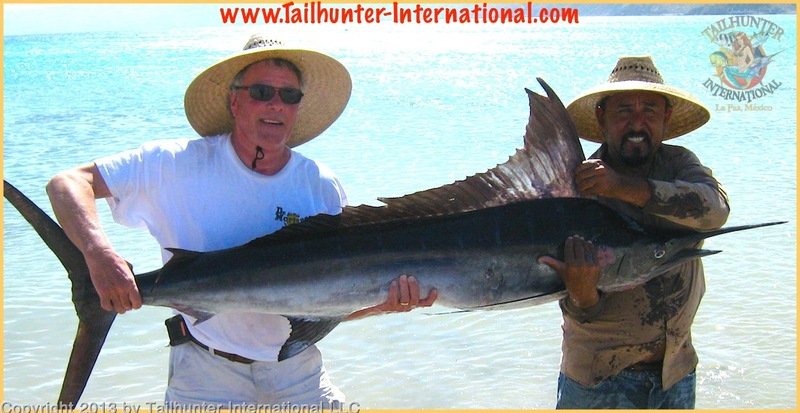 As well, rooster fish up to 60 pounds were taken. Again, very unusual to see rooster fish this late in the season, but they’re there near the rocky and sandy areas close to shore at Las Arenas. A great opportunity for our some of our clients to check it off the bucket list and get one of these exotic fish. As well, the counts also showed some nice cabrilla, sierra, jack crevalle, bonito, snapper and pargo! Some of this is because the seasons are changing, as mentioned above. But, also because anglers were making a point to chase these species because they were tired of dorado. Alot of the anglers simply changed to light tackle…like bass gear and had some fun catching-and-releasing dorado as fast as they could go! Also, we had wahoo hooked almost every day. I say “hooked” because almost every one of them hooked got off! Just fishing! But, obviously the speedsters are still out there. Some of the hookups occurred while guys were fishing for dorado and the dorado where schooling around at the panga and a wahoo would zip in and pick up the bait. On light tackle or straight mono, it’s not much of a battle when a wahoo going 50-70 mph with razor sharp teeth grabs the bait! If the hooks isn’t set “just right” it’s a short battle! If you’re in Cabo this week, that’s where we’re headed as well. 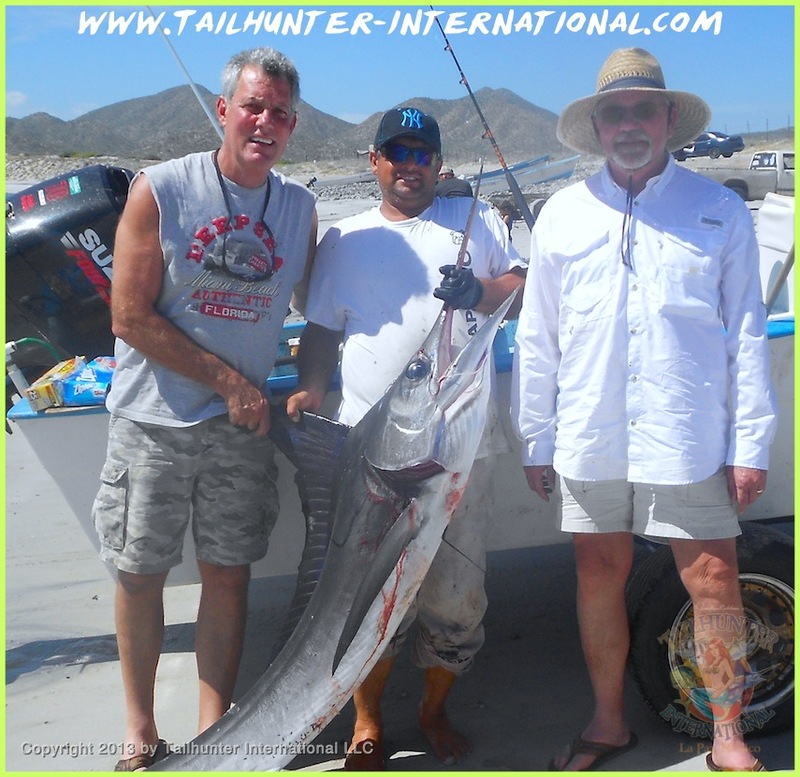 The first week of November is always the popular crazy Western Outdoor News Tuna Jackpot one of the largest fishing tournaments in Cabo each year. Jill and I work the tournament which will take place from Wednesday to Saturday with the Wyndham Hotel as the anchor hotel. It’s always a blast with big fish a big parties! Both of us will be at registration on Wednesday and I will be working the scales while Jill is on the tournament central tent handling logistics. Of course, we’ll also be at all the parties and banquets to meet-and-greet! The motto of the tournamet is “FISH HARD and PARTY HARDER!” If you’re in Cabo, come say hi and watch the festivities. As of this writing, there’s more than 120 international teams already entered and there’s always room for you! C’mon down and play!